The Rangeomorpha contains ~20 largely frond-shaped Ediacaran species, defined by the presence of branching modules called 'rangeomorph units' (Narbonne et al., 2009), and were some of the first macroscopic organisms to appear in the geological record. They dominated Ediacaran deep-water ecosystems for around 15 million years, before experiencing a decline in diversity and eventually disappearing from the fossil record at the end of the Ediacaran Period. While most researchers agree that the rangeomorphs constitute an extinct clade, exactly where they fit in the Tree of Life remains the subject of debate. Some have argued that they are stem-group animals (Xiao and Laflamme, 2009), but others suggest they are ancestors of both animals and fungi lying even further down the evolutionary tree (Sperling et al., 2007), or even part of a (now extinct) kingdom, the Vendobionta (Seilacher, 1992). Communities of rangeomorphs exhibit different modes of life, and exhibit what is known as ecological tiering - the division of an ecospace in different niches (see Clapham & Narbonne, 2002). Some taxa, such as Fractofusus andersoni, would have been found lying flat on the sea floor, whereas others, such as Charnia masoni, projected higher into the water column, as they competed for nutrients or energy sources. The rangeomorph branching unit is a self-similar branching arrangement that is repeated throughout the frondose part of the organism, with the largest branches and smallest branches essentially looking exactly the same, just at different scales. This has lead to the rangeomorphs being described as pseudo-fractal in the past. It is thought that their self-similar branching pattern would have increased the surface area of these organisms, helping them to efficiently extract nutrients from the water column. 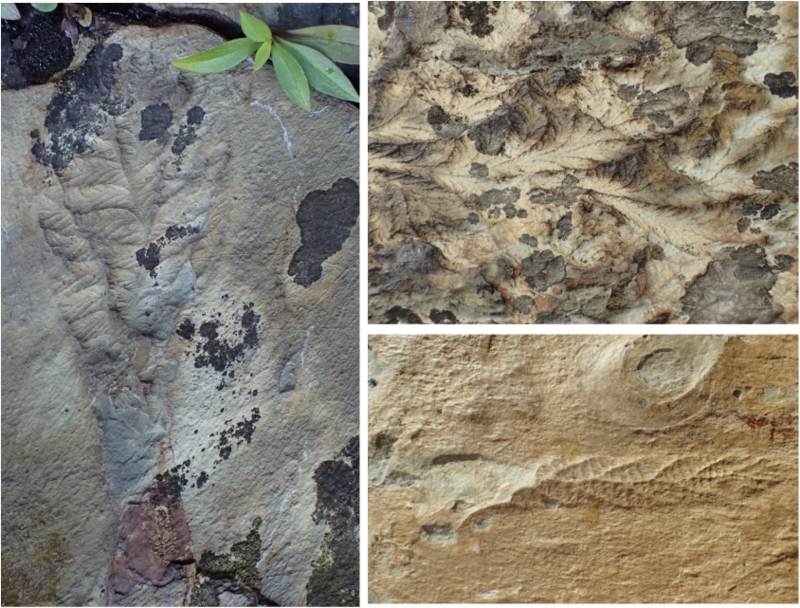 The rangeomorphs are some of the most well-studied Ediacaran organisms, but they remain amongst the most puzzling. Whatever they were, they represent a hugely successful group of organisms that dominated their particular habitat within the Ediacaran oceans. Rangeomorph fossils from Newfoundland. Left: Beothukis plumosa; Top Right: A single primary branch in a specimen of Bradgatia sp. ; Bottom Right: Charnia masoni.